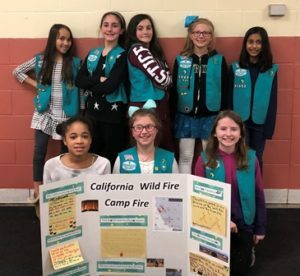 Northborough – Northborough Girl Scout Troop 30652 is partnering with a Girl Scout family in California who has been affected by this fall’s devastating wildfires. The nine fifth grade scouts from Fannie E. Proctor and Marion E. Zeh schools are led by Maria Boeckeler and Naoko Conway. When they heard about the California wildfires and all the destruction and loss in its path, they decided to research the topic and wanted to help in some way. Through the Girl Scouts of Northern California North Central area Adopt-a-Family program, the Northborough troop will directly help a Girl Scout family that has lost their home in the fire. The funds for the family sponsorship have been raised through proceeds from the girls’ fall product sale. In addition, the girls will be selling handmade crafts at the annual Holiday Kids’ Shop being held on Saturday, Dec. 8 at the First Parish Church of Northborough located at 40 Church Street from 11 a.m.to 1:30 p.m. Items such as gas cards and gift cards for clothing and other necessities will be purchased and sent to California. The girls will also display at the fair a poster they created that highlights facts and information about the Northern California Camp Fire, which killed at least 88 civilians, injured scores of others, and decimated complete towns. Each Scout was responsible for a different section. It includes organizations that assist families during fire tragedies, how large fires affect air quality, a map of where the California active fires were, and how nature uses the ashes from certain trees as fertilizer for regrowth. The loss of pets and the number of abandoned pets due to the fires also are big concerns for the girls. Girl Scout Tylia has cousins who live in California and needed to evacuate. Girl Scout Stephanie shared a personal experience that she had with a fire while staying in Puerto Rico. “It’s not all about how important the building is, but the safety of people and pets,” she said. The troop has decided that this topic is so important that they would like it to be the foundation of their Bronze Award. They are hoping to involve the community and the Northborough Fire Department to bring attention to fire safety. For more information on how to help Girl Scouts in California, visit www.gsnorcal.org/en/our-council/news/2018/camp-fire-updates.html. 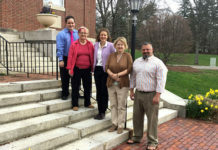 For more information on Northborough Girl Scouts visit www.northboroughgirlscouts.org.